Bursting with elegance. These spectacular earrings add pizzazz! Thoughtfully crafted of enduring 14 karat white gold, these earrings feature a secure and comfortable French clip closure. The combined 2.07 carat total weight radiant cut diamonds that are housed in the center are Near Colorless and SI1 clarity. 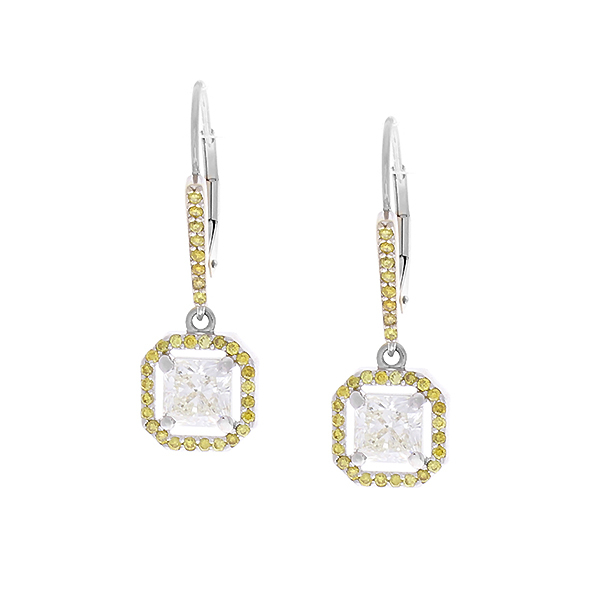 The drop are cleverly complemented by 0.45 carat total weight of intriguing natural vivid fancy yellow diamonds. The remarkable pairing elevated the overall design and helps you stand out from the crowd.